Heat exchangers for drying human consumption and space heating products built in stainless steel and carbon steel. Electrical shielded resistors driven by engine air boosters fully shielded with dust proof and splash. Built with steel painted case with horizontal blinds manually adjustable. Single phase 220 v - 50 c.
Three phase 220/380 v - 50 c.
KW 2 - 3 - 4.5 - 6 - 9 - 12 - 18 and specials with the capacity required by the client. Equipment designed to exhaust large volumes of air at low speed, with minimum power installed and completely silent. Built with galvanized sheet to prevent rusting, free maintenance. Used to keep the heat or cold in a closed environment and are located at the top of the doors. Extra flat and light in weight. Approximate Scope: 600 - 2000 - 5000 mts. Manufactured upon request. Mix of modular filters and coolers heaters, humidifiers, mufflers and fans according to the needs. There is no limit of size and composition. It eliminates welding fumes at the source site. Pipe diameters Ø 100/150 mm. Unit to interleave circular or square duct. 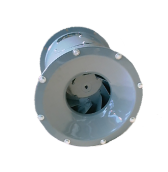 Circular flow 175/8500 m³ / h.
Square 530/13600 m³ / h.
Combination of compact design and lightweight in lineal systems as in Aerofoil fans with added benefits like pressures up to 200 mm CA, lower noise levels, losses of low current taps, excellent distribution areas and stable pressure features.